The Pacific Ridge JV and Freshman Academic League teams added two more victories to the season's win column during a match against Sage Creek High School on January 22nd. The JV team won handily, 43-20, and the Freshman team posted an impressive 44-21 win. Sage Creek does not have a Varsity Academic League team, so the Pacific Ridge Varsity team faced off against a group of intrepid faculty members for a bit of fun-spirited competition. 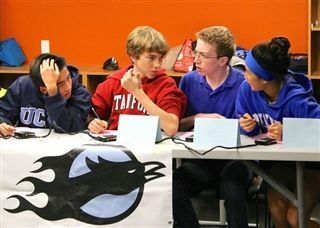 All three Academic League teams are back in action tonight with a match against Carlsbad High. The next home match is scheduled for Thursday, Feb. 5th at 6:30 p.m.